Can I Use External Hard Drives as NAS Storage? - Ask Leo! 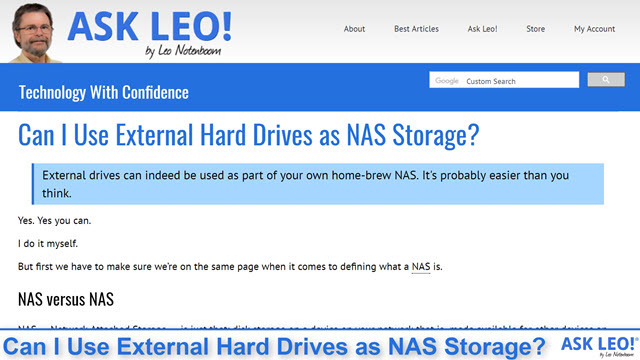 But first we have to make sure we’re on the same page when it comes to defining what a NAS is. NAS — Network Attached Storage — is just that: disk storage on a device on your network that is made available for other devices on your network to access. Almost any storage will do. RAID for either speed or reliability or both. 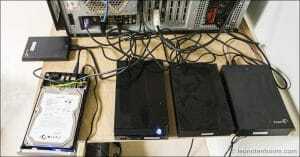 RAID uses multiple disk drives to store data. Multiple file-sharing protocols, including those for Windows, Apple, and Linux, as well as potentially others, such as FTP or SFTP. Multiple ethernet connections for speed. If you don’t need any of that — as I don’t — then just having storage on your local network is a piece of cake. Attach those external hard drives to a computer on your network. Share those drives using the sharing facilities of the installed operating system, like Windows. Done. You now have your own NAS. A basic NAS actually turns out to be a great use for an older machine. The backside of my NAS machine (click for larger). In my case, my NAS is my old desktop machine of two generations (about 10 years) ago. I installed Linux Mint on it, and using Samba file sharing, have three internal drives and five external drives shared by any computer on my network. Shown here, it’s not pretty, but it lives in my basement, so it doesn’t have to be. Since it’s running Linux, I can do other things with the machine as well (which I do), but its primary job is to sit there and share those drives, acting as a basic NAS. You don’t have to run Linux (though of course you can), and you don’t have to get another device (though again, you can if you want to). Take that old machine you have lying around, install the most recent version of Windows you can (for security purposes), attach the drives, and share them. If you or your machine aren’t up for installing another copy of Windows, and Linux isn’t your cup of tea, another alternative is to install FreeNAS on it. FreeNAS is a Linux-based distribution that is optimized specifically to act more like a dedicated NAS than a general-purpose operating system. It’s quite popular, and I ran it long ago with much success. But, honestly, any computer already connected to your network could act as a basic NAS. The one thing I will caution is the need to back up. … which you should be doing anyway. The old rule of thumb still applies: if your data is stored in only one place, it’s not backed up. Even if that place is a NAS — any NAS. And that’s the primary purpose of my own NAS: backing up files, folders, and work in progress from the other machines on my network. Can I backup one computer to another? - Your computers are probably already attached over your home network. You just need to "share" them. « Previous post: How Can I Boost My Laptop’s Performance? The picture of your NAS systems shows at least three external hard drives attached to the old computer you are using for the NAS. How do you keep heat from rapidly destroying the external HDs when they run all the time? It’s never been a problem. They don’t get that hot. My concern with this arrangement in a Windows environment is drive letter assignment. Lets assume with 8 extra drives they’re all letters E thru J. If drive E fails, the next time that system restarts, drives F-J could all be relabeled one letter down (E-I). This could mean data from the networked PC’s might write to the wrong drive … or am I overthinking this (or not thinking enough, depending on how you look it it :-P) ? When you share the drives you share by name, so external computers see no difference. And I believe drive letter assignments are persistent anyway. (If not, you can manually assign drive letters using disk manager, and those are persistent). Each drive has a unique ID or signature that is stored on the drive in an area inaccessible to normal read/write operations, however this ID can be read/written with specialized disk editing software such as HexProbe. When a disk is reinserted the registry is checked to see if a disk with that ID has previously been assigned a drive letter. If so, and if that letter is not currently in use, it is reused. Thanks much for the clarification. I had suspected as such (I believe it’s the UUID if I’m not mistaken — at least that’s what it’s called in Linux). Something to consider when reusing an older machine for a NAS is the power consumption. Since the NAS will probably be running 24/7, you want the machine to have the lowest power consumption possible. I recently replaced my NAS with a new one computer that I scored on eBay for cheap. The new computer has an i7 processor. That CPU uses substantially less power at idle (which is where the NAS is running most of the time) than did the old CPU. I also replaced all the old hard drives with low power consumption hard drives, both internal C:\ and D:\ and all 8 external data storage drives (~50TB of storage space.) I also installed a high efficiency power factor corrected power supply in the machine. The result of all these changes was to reduce the power consumption of the NAS by over 120 watts when compared to the old machine. This reduced the electricity costs by about $120.00 per year for running the NAS. As a bonus, the increased processing power of the i7 CPU allows me to run automated drive to drive duplicate backups while simultaneously supporting normal file transfers into and out of the NAS, and running a media server on the NAS. Good point about consumption of electricity! I have a netbook with a surprisingly large hard drive. Its role is to host daily backup from my primary computer. Works great, very low cost. I have a 4Tb external USB attached directly to my router, this is also a pretty effective NAS. The only problem is that the ownership permissions keep reverting back to default after each windows upgrade and I find myself unable to move or copy files from the HD unless I go and reset all the permissions and change the ownership. Is there any way to stop this happening?